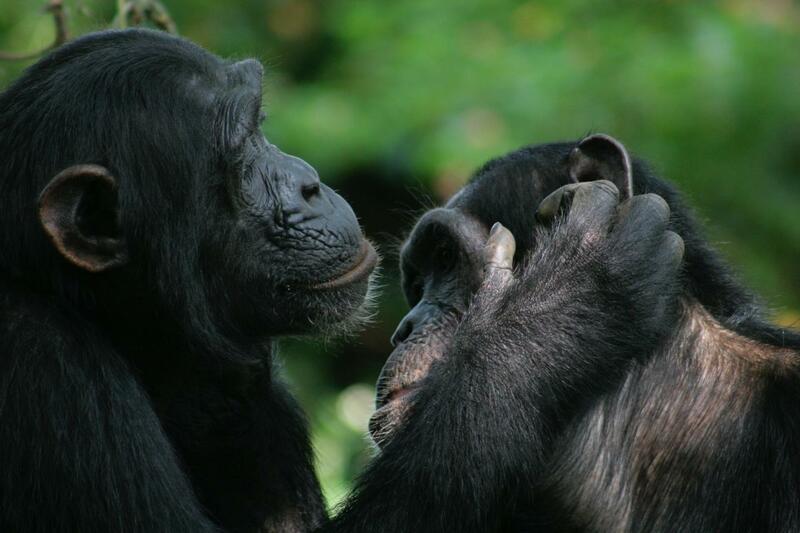 If a bonobo and a chimpanzee were to meet face to face, they could probably understand each other's gestures. In an article publishing 27 February in the open access journal PLOS Biology, researchers from the Universities of St Andrews, York, and Kyoto have found that many of the gestures used by bonobos and chimpanzees share the same meanings. The two great ape species are closely related, having separated about 1-2 million years ago, and we already know that they share many of the same gestures, but the degree of similarity between the meanings of the chimpanzee and bonobo gestures is a new discovery. In the new study the researchers first define the meaning of each bonobo gesture by looking at the reaction that it elicits and whether the bonobo who gestured was "satisfied" with the reaction. If, for example, the first bonobo presents an arm in front of a second bonobo (video for "present (climb on)" at https://vimeo.com/214146154; videos for all gestures at http://greatapedictionary.ac.uk/video-resources/gesture-videos/), the second bonobo responds by climbing onto the first bonobo's back and the first bonobo then stops gesturing, the researchers infer that the first bonobo was satisfied, and therefore that the meaning of that single gesture is "climb on me". Taken over many observations, the researchers were able to systematically define the sets of meanings of 33 bonobo gesture types and compare them to gesture meanings already known for chimpanzees. It appears that many gesture meanings are shared by both species, and perhaps may have also been shared by our last common ancestor. "The overlap in gesture meanings between bonobos and chimpanzees is quite substantial and may indicate that the gestures are biologically inherited", says lead author Kirsty Graham from the University of York. "In future, we hope to learn more about how gestures develop through the apes' lifetimes. We are also starting to examine whether humans share any of these great ape gestures and understand the gesture meanings, so watch this space." Funding: JSPS Core-to-Core Program http://www.jsps.go.jp/english/e-core_to_core/ (grant number 2012-2014, 2015-2017). The funder had no role in study design, data collection and analysis, decision to publish, or preparation of the manuscript. Japan Society for the Promotion of Science Grant in Aid for Scientific Research (grant number 25304019, 25257407, 26257408). The funder had no role in study design, data collection and analysis, decision to publish, or preparation of the manuscript. University of St Andrews https://www.st-andrews.ac.uk/study/ug/fees-and-funding/scholarships/600th-wardlaw/ (grant number 600th Anniversary Scholarship). The funder had no role in study design, data collection and analysis, decision to publish, or preparation of the manuscript. Wenner-Gren Foundation http://www.wennergren.org/ (grant number Gr. 8950). The funder had no role in study design, data collection and analysis, decision to publish, or preparation of the manuscript.